To develop a confident, competent and complete martial artist. You can achieve many personal objectives – such as learning self-defense skills, losing weight, improving physical condition, and gaining self-confidence – on the journey to becoming a confident, competent, and complete martial artist. Combine the standing techniques of soo bahk do (Korean karate) with the ground techniques and fight strategy of Gracie jiu-jitsu and whole body, focused fitness training. 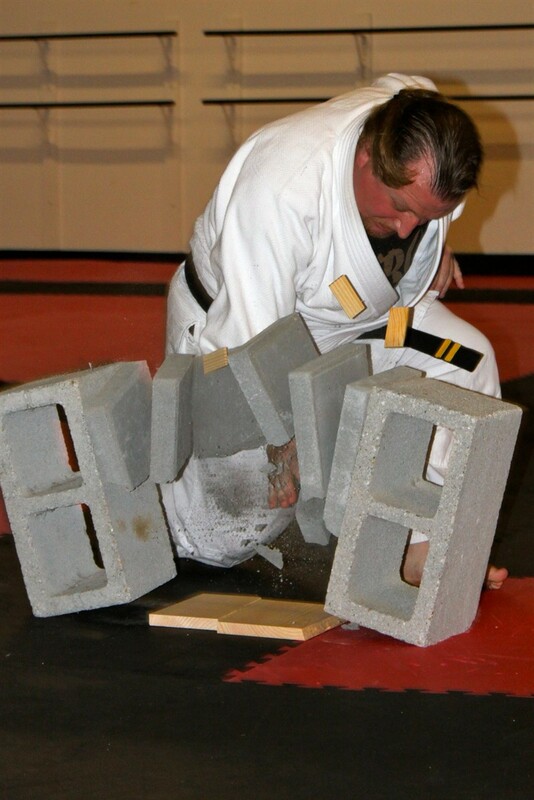 At Hampton Roads Karate, we supplement soo bahk do (a standing/striking art) with Gracie jiu-jitsu (a complete martial art in itself that relies on taking your attacker to the ground then neutralizing them using leverage rather than strength or speed). Tae kwon do and boxing footwork and stand-up combinations supplement the karate training. The two programs for adults are ADULT KARATE and ADULT GRACIE JIU-JITSU (Gracie Combatives and, coming soon, the Master Cycle). See the detailed descriptions of each class in the following paragraphs. You may attend all classes that are appropriate for your skill level. A beginner, for example, may attend the two beginner ADULT KARATE classes and two GRACIE COMBATIVES classes...that's four opportunities to train each week. You may also train at Norfolk Karate Academy/Gracie Jiu-Jitsu Norfolk for up to five more classes every week! To qualify as a black belt at Hampton Roads Karate, you must complete the ADULT KARATE curriculum and earn your blue belt in Gracie Jiu-Jitsu. In our Adult Karate classes, we use soo bahk do (Korean word for "karate") to teach how to strike with power, move with balance and coordination, and avoid being hit. Each class consists of a brief warm-up stretch followed striking drills (kicking and punching bags/pads), sparring drills, and forms (kata) practice. Forms (kata) serve as our link to traditional training methods and is a proven method for developing powerful stances and understanding of body mechanics. We supplement the standing techniques of karate with Gracie jiu-jitsu (a complete martial art in itself that relies on taking your attacker to the ground then neutralizing them using leverage rather than strength or speed). We borrow some techniques and training methodology from Tae kwon do, boxing, wrestling, and krav maga/haganah, but this is NOT a mixed martial arts class. The focus is on self-defense, not sport. The program encompasses approximately 196 hours of instruction divided into Beginner, Intermediate, and Advanced classes culminating in examination for 1st degree black belt. We require that you earn a blue belt in Gracie Jiu-Jitsu as a prerequisite for award of a black belt from Hampton Roads Karate Academy. In the late 1920s Grand Master Helio Gracie created Gracie or Brazilian Jiu-Jitsu after he realized that he was physically too frail to utilize the traditional Japanese techniques. Proven over the last 80 years to be the most reliable system for a smaller person to defeat a larger, more athletic opponent, the techniques of Gracie Jiu-Jitsu are based on precise timing and effective use of leverage so that virtually anyone can do it, man or woman, regardless of their size or athletic ability. Although Gracie Jiu-Jitsu consists of over 600 techniques, studies of fights conducted by members of the Gracie Family have shown that 36 techniques have been used more often and with greater success than all the other techniques combined. Soon after these studies were conducted, the Gracies realized that the fastest way to effectively prepare any new student to defend themselves against a larger, untrained opponent was to focus entirely on teaching them these 36 essential techniques. This realization led to the birth of the Gracie Combatives course. The techniques featured in Gracie Combatives have been adopted by the U.S. Army, Navy Seals, Secret Service, FBI, and countless other law enforcement agencies around the world. The techniques featured in Gracie Combatives have been adopted by the U.S. Army, Navy Seals, Secret Service, FBI, and countless other law enforcement agencies around the world. Hampton Roads Karate Academy and the Bushin Martial Arts Academy in Williamsburg are the exclusive providers in the Hampton Roads area of this exceptional course developed by the Gracie Jiu-Jitsu Academy in Torrance, California. For more information about Gracie Combatives, visit here. The Fastest Way to Street Readiness - Guaranteed! The Best of Gracie Jiu-Jitsu (no experience necessary! The 36 Gracie Combatives techniques have been strategically divided into 23 one hour classes so that you can complete the course at your own pace. Each lesson is taught using unique Gracie Teaching Methods so that no previous experience is required to participate in any of the 23 lessons. As a result, you can complete them in any order. Upon enrolling, you will be issued a Combatives Card on which all your progress will be tracked and each month you will receive a Combatives Calendar that depicts which techniques will be taught in each lesson throughout the entire month. Once you complete each of the 23 Gracie Combatives lessons two times, you will qualify to participate in the Reflex Development Classes. In these classes you will learn to execute all 36 techniques in every possible combination by conducting carefully scripted Fight Simulation Drills. Once you master all techniques in the context of the Fight Simulation Drills you will be considered “Street Ready." Once you complete each of the Gracie Combatives lesson a third time and you master the 36 techniques in the context of the Reflex Development Classes, you will be considered for promotion to Gracie Jiu-Jitsu Blue Belt! The test for blue belt requires successful demonstration in video format of each of the Gracie Combatives techniques in four drills and then in a freestyle fight simulation. The video test is graded via internet by an instructor at a certified training center and is personally verified by the Gracie Academy in Torrance. Since its inception, Gracie Combatives has been more effective at taking students from no knowledge to “street ready” than any other course in the history of Gracie or Brazilian Jiu-Jitsu. What makes Gracie Combatives so unique, besides the street applicability of its techniques, is the structure of the course and the way in which we present the techniques. In place of the random curriculum that characterizes nearly all other BJJ programs, we designed Gracie Combatives specifically to ensure that each new student understands the principles, learns the techniques, and builds their reflexes, without confusion, in the absolute least amount of time! Beyond blue belt, Gracie Jiu-Jitsu consists of hundreds of advanced techniques, all of which we have organized into a clearly defined, systematic curriculum called the Master Cycle. In order to streamline the learning process, we have divided all the techniques in the Master Cycle into seven Positional Chapters: Mount, Side Mount, Guard, Half Guard, Back Mount, Leg Locks, and Standing. For more detailed learning, we further divided each positional chapter into 2-4 specialized subsections. In the Gracie Combatives course, the objective is to give the students a broad understanding of the essential principles and techniques of Gracie Jiu-Jitsu. In the Master Cycle course, the objective is to take each student from basic understanding to positional mastery by dedicating 8-16 weeks to the study of each chapter before moving on to the next. By spending such a prolonged period of time on the specialized study of one position, students learn several closely related techniques. This enables them to “connect the dots” more effectively than if they were learning random techniques, from random positions, every day of the week. This type of scrambled learning, although entertaining in the short term, greatly increases the amount of time it takes for the students to master each position. The secret to success as a Master Cycle group class student is disciplined attendance. Since we will dedicate a finite number of weeks to the study of each position before moving on to the next, the students who benefit most are those who attend class most often during each chapter. Students understand that once we complete a chapter, we will not repeat the instruction until we have cycled through the other six chapters. Each time a student recycles through the 7 chapters they have the chance to learn new techniques as well as strengthen and expand their foundation of existing skills. This cyclic process continues for several years until the student becomes a master in every position of Gracie Jiu-Jitsu, one of several prerequisites for promotion to black belt.